The “ViP-Suite” apartment is very modern and technological, with spacious rooms. •	Music in every room. •	Two Apple Mac computers. •	The apartment has air conditioning, which can be independently controlled. A roofed terrace is accessible from the family room and kitchen. It’s the perfect breakfast place! Your private outdoor eating area is located in the garden in front of the kitchen. This area can comfortably seat 10 people. 42-inch flat-screen Full-HD TV, DVD and BluRay Disc player. An HD satellite receiver with all the European free channels (Astra and Eutelsat). Exciting Home-Cinema system for viewing films: big screen (2.5 meters) with Full-HD video projector, powerful surround-sound system, with 6 in-wall loudspeakers + 1 subwoofer for bass cinema-like effects. In the ViP-Suite there are 3 bedrooms. •	Free parking is available on the property which is enclosed by a security gate. Three new apartments for a dream vacation set in a modern villa. It’s a peaceful place surrounded by a lush nature, far from the hustle and bustle of city life. 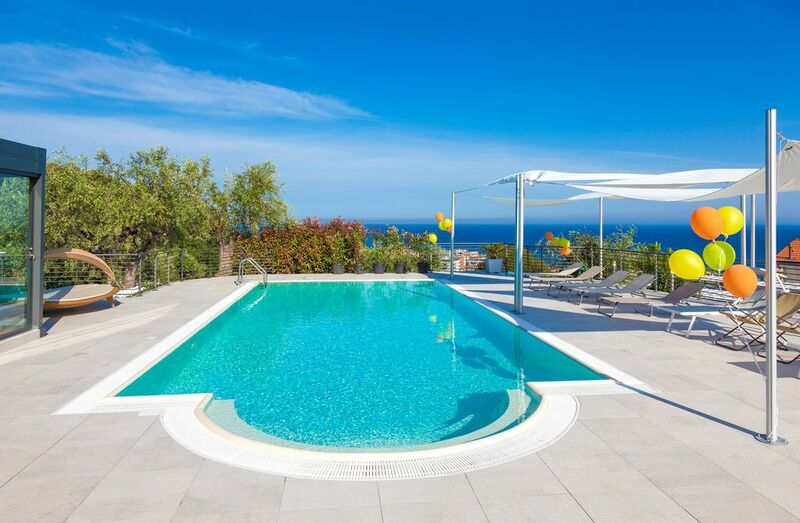 The villa offers a swimming pool, large Jacuzzi, garden and an incredible view of the Ligurian sea. It’s positioned 50 meters above sea level and only 5 minutes away from the beach. The Villa is encompassed by of olive trees, flowers and plants, creating a typical Mediterranean garden. The lawn is the outdoor carpet for the house and pool area. The pool with its panoramic sea view is on the garden plateau (in Northern Italy “il Poggiolo” means “balcony”). Villa il Poggiolo is perfect for summer sun, swimming and fun with family and friends. The swimming pool and the outside area have been totally renovated to guarantee fun and relax. This quality space is surrounded by nature and has a breathtaking sea view. The new infinity edged swimming pool is beautiful to look at but not only, this type of pool maintains better water quality. Our constantly controlled water purification system guarantees maximum hygiene using the latest technology. The non-slip floor that surrounds the pool won’t burn your feet under the hot July, and August sun! The solarium area is shaded by four modern sail awnings and there are numerous sunbeds, beach chairs, and a hammock at your disposal. The swimming pool measures 10 meters by 5 (32 feet by 16), the Jacuzzi hot tub accommodating up to 6 people is situated in a glass house with a motorized roof which is perfect for relaxing in the evenings to gaze at the stars. Controlling the color of the changing lights in the pools’ water has never been so easy, with the click of the remote control you can program your own nightly light-show. is an experience that touches all your senses. Imagine yourself spending a relaxing evening immersed in the warm water of the Jacuzzi. The red fireplace lit, soft music playing and the soft colored changing lights in the back ground, gazing up at the star studded sky. All these extra touches create an ideal romantic atmosphere, with a sea view and the city lights below. This is the atmosphere of the new “ViP mini-spa”! The “mini-spa” has glass sliding doors, and a motorized roof that can be opened and closed with a click of the remote control. The Jacuzzi can be used also in the winter. There is an iPad at your disposal which allows you to transmit music to the garden and the “mini-spa” for listening pleasure. All of this is possible thanks to the “Bose” outside music system. This system is remote controlled by you permitting you to activate or deactivate the areas that you desire. The iPad contains a vast musical selection, and also a “Spotifiy Premium” account that you can freely use. The garden, the pingpong table, the wood burning oven, the BBQ, the swimming pool, and the “mini-spa” are shared with all the guests of the villa, therefore you don’t have the exclusive use of these features. You can have your dinner prepared by a personal professional chef, who can also offer you Italian cooking courses where you will receive a “certificate of participation” upon completion. Diano Marina is a tourist village that became popular during the 1800’s as a seaside resort and it is visited by tourists from all over the Europe. The Western Ligurian Riviera climate is famous for being delightful in the summer and mild in the winter. This makes Diano Marina, an ideal destination for holidays throughout the year. All along the coast there are sandy beaches, with nice beach establishments. We suggest visiting the natural and historical beauties nearby us, like the medieval village of Cervo Ligure, Hambury’s botanical gardens or the marvelous inland villages as Dolceacqua, Bussana Vecchia, Triora and Apricale. As an alternative, we suggest longer trips such as the Genoa’s Aquarium (the second biggest in Europe), Portofino or the “Cinque Terre“, or the nearby Montecarlo and French Côte d’Azur. 3 independent holiday apartments in a luxury villa. The villa has been recently renovated and refurnished with high quality modern furniture. Fast, free Wi-Fi unlimited, everywhere. Seven hot-spots guarantee full Wi-Fi coverage in the apartments and also in the garden. The villa contains three separate apartments, all furnished with the most up-to-date technology and accessories. 1) ViP Suite – is very large (160 square meters / 1700 square feet) and occupies the entire main floor. It can comfortably accommodate 8, up to 10 guests. 2) ViP Panorama – is smaller (60 square meters / 650 square feet) and is on the first floor. It can comfortably accommodate 4, up to 6 guests. 3) ViP Panorama 2 – is almost identical to the ViP Panorama apartment, and it is also located on the first floor. It can comfortably accommodate 4, up to 6 guests. This was my parent's property, where I grew up. I have recently renewed the villa and I have added the swimming pool. And now I am proud to offer it to my guests. It's in the best location of Diano Marina, with a stunning sea-view. You will find in my house a lot of technology! Large and well lit, includes tub with shower, sink and large mirror. Great Villa! We had a wonderful stay here. Property owner/manager was very proactive in communicating with us about our stay. The apartment is very spacious, clean, modern, and well equipped. There is ample parking on the property. From the apartment, there are shops and restaurants close by. We would absolutely love to stay here again if we are back to visiting this area! Dear Quyen, thank you very much for this comment. We are happy that you enjoyed your stay at Villa il Poggiolo, and we wait for you again with great pleasure! Dear Wase, it was a pleasure meeting you and your big family from all over the world! We are happy that you enjoyed your family reunion here at Villa il Poggiolo, and we wait for you again with great pleasure. This was an amazing place, most gorgeous views with the nicest pool/jacuzzi area. The host, Mauro was so accommodating and excellent to communicate with. The villa was very nice with comfortable bedrooms and hi tech projection tv as well as nicely stocked kitchen. I highly recommend it! We enjoyed a wonderfully relaxing week at Il Poggiolo. The VIP Suite is very well furnished with great kitchen facilities and a brilliant lounge with very comfortable sofa, TV, Projector screen for movies, surround sound. The bedrooms were large with plenty of storage and comfortable beds. We stayed during the last week of April and the weather was fairly kind, allowing a bit of downtime around the pool area and the hot tub was more useful than the pool at this time of year but both have spectacular views of the ocean. Mauro was very helpful from start to finish and would highly recommend the villa. Dear Michelle, thank you very much for this review. We hope to have you as guest again soon! We loved our vacation in the Italian Riviera! The house was absolutely beautiful. The location was perfect! We did not want to leave. The house was exactly as described we loved the fact that we could play music anywhere inside or outside of the house. We spent our evenings watching movies on big screen TV. The kids loved it. The kitchen was perfect, we were able to prepare large family meals. I would definitely recommend this house to all of my friends and family. As far as location goes we were able to walk to the beach. During the day we traveled to picture perfect cities up and down the coast and inland. I have never been to this part of Italy before and although I hadn't heard of this town before I felt so lucky that we found this amazing place to stay. We rented the large house with another family and we had other friends rent the upstairs condo. It was a perfect place for groups and families. Some day we will be back! Dear Kathy, thank you so much for this great review! I will come to visit your San Francisco very soon! Die Villa, das Jacuzzi, der Pool, das technische Equipment, die Hängematte, der Meerblick, die Sonnenliegen, der Grillplatz..... EIN TRAUM! Man fährt durch das elektrische Gitter in den Hof und fühlt sich sofort wie zu Hause! Wir wurden von einem sehr zuvorkommenden Gastgeber begrüßt und mit vielen guten Tipps für leckeres Essen und Sehenswürdigkeiten in der Nähe versorgt. Die Wohnung, die wir zu zweit gemietet haben, hat traumhaften Meerblick! Unvergesslich! Zudem gibt es wirklich alles, was man in einer Wohnung braucht und noch ein bisschen mehr! Toller, großer Fernseher, einen zweiten TV im Zimmer, Internet, Musik, Filme, Bücher und sogar bunt-beleuchtete Wasserstrahlen in der Dusche... sehr geschmackvolle Einrichtung und Ausstattung, also auch Teller und Gläser, wirklich sehr schön! In dieser Villa kann man absolut perfekt entspannen! Auch sehr ideal für mehrere Familien und Freunde. Es gibt genügend Platz (2 Wohnungen für jeweils 4 Pers. und eine Suite für bis zu 12 Pers). Im Freien findet man genügend Stühle und Tische und ausreichend Sonnenliegen bzw. eine Hängematte und eine sehr schöne Liege -Insel. Der Jacuzzi und das Wasser im Pool waren immer sehr sauber! Überhaupt war alles in perfektem Zustand. Sogar das Tischtennis-Netz war nagelneu! Der Garten war sehr gepflegt und mit einem Bose-Soundsystem konnte man überall im Freien Musik hören. Fazit: Man kommt in der Villa Il Poggiolo an und ist sofort im Urlaub - und man will unbedingt bald wiederkommen! ABSOLUT EMPFEHLENSWERT! Dear Ulli, thank you very much for your nice review! E auguri per la tua carriera di cantante!!! For the readers: please note that this guest stayed in the "ViP Panorama" apartment at the first floor, but the review was published on the "ViP Suite" section.